Here’s a recipe I demonstrated this morning at a masterclass for the Dingle Food Festival. 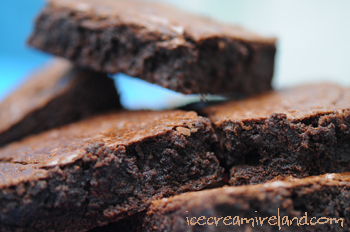 These brownies are very tasty, and they are especially suited for using in ice cream – the olive oil is softer than butter when frozen, which makes them a perfect mix in. However, there is no reason not to enjoy them on their own – they are dense, delicious, and surprisingly healthy, as far as brownies go. 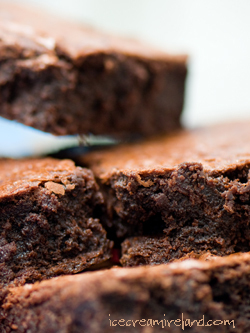 Don’t hold this against them, but they are gluten-free, dairy-free, and since I use cocoa instead of chocolate, the fat content is far lower than in regular brownies. By the way, since most of my ice cream recipes call for 5 egg yolks, this recipe is a perfect use for the leftover egg whites! 3. Add the egg whites s and beat until thoroughly combined. 4. Beat in the olive oil. 5. Use residual olive oil from measuring cup to grease a small baking tray. 6. Mix in the almond flour. 7. Stir in the salt and vanilla. 8. Pour into the baking tray. 10. Allow to cool before cutting up. 11. If you want to use it in ice cream, refrigerate them before adding to the ice cream machine. Ice cream is always attractive in any season and that is no crime.That is such a nice recipe to prepare ice cream this is very nice post thanks for sharing. one thing I like about brownies is their taste with this these are healthy. These are so delicious and with some efforts you can make these.